Hello & welcome to Ed's. How can we help? What our happy customers have to say! 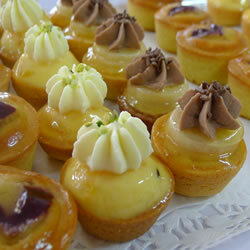 Thank you so very much for the beautiful food you made for our recent event at Carey Baptist College. Everything was very nice. We look forward to doing further business with you for our different events held through the year. Thank you so much for the beautiful lunch catering today – once again! You and your team never let us down – always providing us with the freshiest, tastiest food and “no problem” attitude – always going that little bit extra mile too. We can always rely on you – so THANK YOU! We would like to thank you from the bottom of our hearts for the fantastic wedding cake you made for our special day. 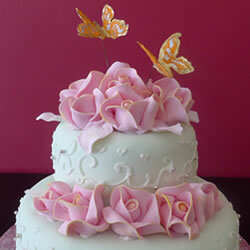 We were already a fan of your cakes and pastries from your shop and had no hesitation in getting you to make our cake. We also appreciated that you listened to what we wanted, and provided helpful advice on matters we hadn't even thought of. On our wedding day, the chocolate layer was so popular, we didn't even get a piece for ourselves! Huge congratulations for Ed's Cake & Coffee House's second year of operation. Bailey Road School enjoys a splendid relationship with you and the staff and of course we all just love your delicious food and the fabulous coffee! Thanks a lot for all the love and hard work you put into the cake! It looked absolutely beautiful and gorgeous.It also tasted delicious. Thanks a lot for taking our last minute order. Thanks for turning our imaginations into reality. 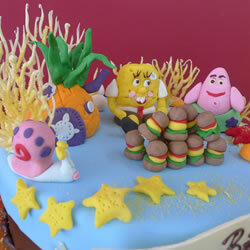 It was great to see how you took a “sea-shell” and chocolate theme and turned it into such a stunning cake. We really appreciate the effort you’ve put into it. The white chocolate shells were lovely and the sea plant thing at the top just looked awesome. I would happily recommend your shop and cakes to everyone I know. Thanks for the excellent service and for your personal touch. You are a cake magician!